The memorial itself is an arresting work of art. 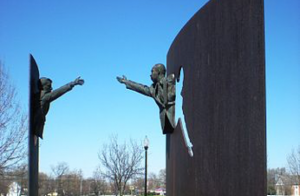 Made from corten steel and bronze it depicts Kennedy and King, on either side of a path, as figures reaching out towards each other in a gesture of solidarity. Each man appears to break free from the steel slabs that would constrain them, tearing themselves from the fabric to reach out to each other across the dividing pathway. In doing so, each leaves behind a perfect silhouette that reaches down to greet the viewer, from either direction. My favourite photo shows a group of young people, of mixed race, looking up towards those two giant figures of the 20th century, with faces full of wonder, and hope. It is that hope and wonder we must carry forward into our communities, our networks and our relationships today. The last couple of years have presented us with enormous challenges. Many of us feel bewildered by recent events, wondering what the future holds. We appear as polarised as we have ever been. Social-political events have shown us how easy it is to turn the clock back, to return to a less enlightened age; an age of intolerance, anger, fear, cynicism and division. I wonder what Senator Kennedy and Dr King, two men whose backgrounds could not have been more different, would make of this today, 50 years after each was gunned down by an assassin’s bullet. It is an easy thing to remain welded to the steel slab of our own self-righteousness. It is comforting to shout into the echo chamber of our own belief systems. It is convenient to turn our backs or withhold the hand of conciliation. Yet none of this will help us in our current predicament. My fervent hope continues; that we display more ‘grace’ as a society, that we become more tolerant and exercise much more restraint in how we communicate with each other. And … be just a bit kinder. Well, we can start by exercising critical reasoning and resume acceptable levels of discourse. We can choose not to accept things as fact simply because they concur with our own beliefs. We can think and speak with fairness and humility. We can listen to others fully and seek to understand before we respond. We can, and this may stretch us, countenance the notion that we may not have all the answers and that others may indeed have a point. 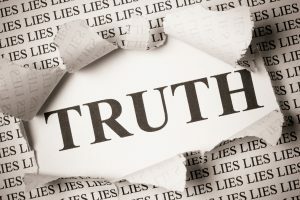 We can and must however, seek the truth and hold others to account in doing so. I return to those giant figures, both heroes of mine. I recall the time I stood at the balcony of the Lorraine Motel in Memphis, where Dr King was shot, and the feeling of loss I felt as I listened to the voice of Mahalia Jackson soar through the air. I remember too, as a young boy, witnessing the righteous anger of my late father as he read the morning paper carrying the news that Bobby Kennedy lay fatally wounded. Yet, I look at the photo of that memorial in Indianapolis and think not so much about what might have been but what can still be. If we choose to make it so. I leave you with the words of the good doctor and the fine young senator who had the courage to reach out across those things that might divide us.